UBN Software Solutions is pleased to announce its participation in CeBIT, India (2016) – India’s largest B2B Tradeshow on Innovative Business Technology, from 8-10 December 2016, at BIEC, Bengaluru. UBNSoft is showcasing innovative IT products namely: SaMICRM, HealthJodi, TechSquad, and PMNext. 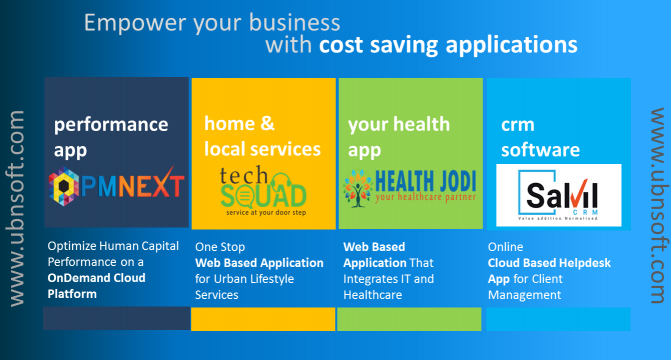 These applications are designed with an aim to serve varied industries, and are focused to deliver comprehensive solutions for forever evolving business environment. Discover The Business Of Technology Innovation! CeBIT-2016 tradeshow focuses on 5 hot trends namely Social Innovation, Internet of Things, Cloud, Mobile & 4G, Virtual Reality. It is a comprehensive business technology trade event that brings together active buyers, IT companies, and influencers from CXOs, government, VCs and Investors, dedicated user industries, MSMEs and SMEs on one unified platform. CeBIT is where diverse range of committed buyers comes together to experience the latest in technology. UBNSoft is one of the best software companies in Bhubaneswar, Odisha reputed for offering quality IT and Offshore Software Development services. We expertise in varied technological platforms: Microsoft Technology, Java Technology, Cloud Technology, Mobile Technology, BI & DWH Technology, and Open Source Technology. Our software services include: Software Product Engineering, Enterprise ADM, Enterprise Mobility, Business Intelligence and Analytics, Data Warehouse, CRM Solutions. It’s really great that people are sharing this infnimatroo.